Not to be confused with Still Alive (song), a song from the original game. Portal: Still Alive is the port of the original Portal game on Xbox 360. It was exclusively released on Xbox Live Arcade on October 22, 2008. It contains the original story of Portal developed by Valve, 14 new bonus test chambers modified from the Portal: The Flash Version MapPack created by We Create Stuff, and 9 new achievements (12 total). There are no additional story-related levels. Portal: Still Alive has not yet been released on PC, although an unofficial mod is available which includes ported versions of all the bonus chambers. Portal – the original game released in October 2007 as part of The Orange Box. 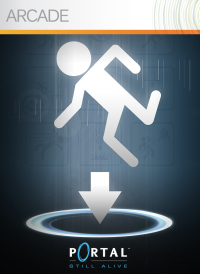 Portal 2 – the sequel to Portal, released in April 2011. This page was last modified on 27 April 2018, at 21:27.